Panel Based Atlas Stand, Elem. Panel Based Dictionary Stand, Elem. 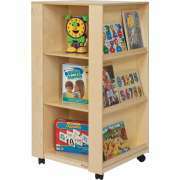 Keep students up to date and in the know with library displays from Hertz Furniture. With the right library furniture, you can encourage students and patrons to sit down and dive into a book. Where should you keep reference materials in the school library? Some great atlas stands and dictionary stands will get the job done right. We offer beautiful displays for diverse kinds of literature. 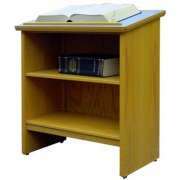 Atlas and dictionary stands keep often-used reference materials within easy reach. 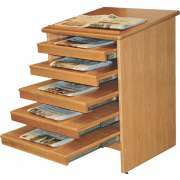 Newspaper stands offer access to news articles while keeping the papers intact. 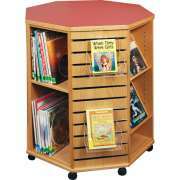 Available in adult and elementary school heights, our library displays will enhance any school or public library. Besides bookshelves, what other kinds of library displays do I need? Bookshelves aren’t the only furniture you need for the literature in your library. A fully-stocked reading room requires reference materials and current periodicals. If you are planning on having these things, you also need the correct furniture to support them. When it comes to storing magazines, atlases and dictionaries, you will need some special library displays. Why do I need a dictionary stand? Dictionary stands make it easy for patrons to look up new and difficult words. 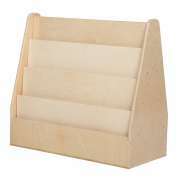 Rather than requiring patrons to search for a commonly-used reference book, a dictionary stand will keep it prominently-displayed. When a dictionary has its own display space, students are more likely to use it rather than running to a computer every time something has to be looked up, or simply glossing over unknown terms which may prove to be important in the future. In the digital era, students are likely to look up terms using apps and websites rather than turning to a good old-fashioned reference book. In order to encourage students to look things up in a book, you need to put dictionaries in an accessible space. 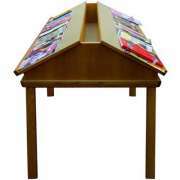 Dictionary book stands will encourage students to develop proper research skills, rather than looking for the easy way out. Where do you keep an atlas in a library? Dictionaries aren’t the only reference books that are needed in a research space. Atlases and encyclopedias are also great to have, especially when doing work in history or geography. Atlas stands from Russwood Library Furniture have pullout shelves with safety stops to prevent accidental removal. This makes it easy for patrons to access various volumes and see what’s on the shelves without having to pull everything out. How do you keep newspapers organized in a library? Encourage everyone to stay up to date with a great newspaper rack in your public or school library. When periodicals are organized in a place where they are easy to find, students will have a great way to do current events reports, even if they don’t get newspapers at home. Additionally, when people come into the reading room to relax, they will have the option of reading newspapers as well as books. 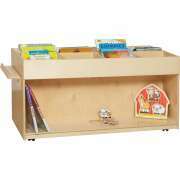 What kind of childrens library furniture should I get? 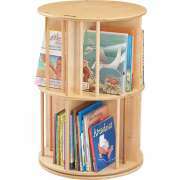 If you have a children’s section, you want to make sure that it is furnished with appropriately-sized library furniture. 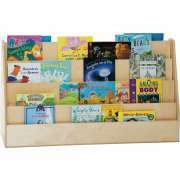 Children’s book displays keep literature organized in a space that is accessible to young readers. 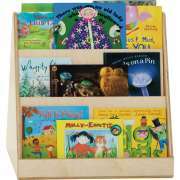 They are the perfect place for books related to the time of year, a theme or Read Across America Day. 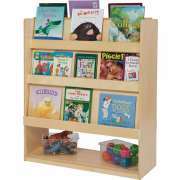 With age-appropriate books on eye level, little ones can choose the titles and covers that interest them. 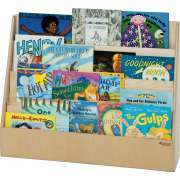 Separate compartments enable you to arrange children’s literature by topic or reading level. To make your library new and exciting every time people enter, it is a good idea to rotate which titles are displayed. 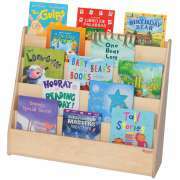 A picture book display table offers the perfect place to show off new acquisitions or display books that are related to a seasonal or school-wide theme. 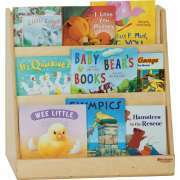 With this great piece of library furniture, you can encourage young children and their parents to work together on developing their early reading habits. At Hertz Furniture, we know what a difference it can make when you have the right library furniture. 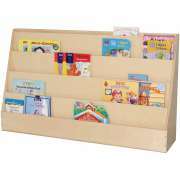 Our dictionary stands, book displays and newspaper display racks will help you find the proper place for various kinds of literature. 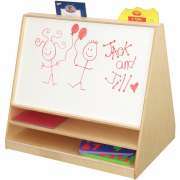 With everything displayed properly and prominently children and adults alike will look forward to entering you reading space to do research, finish homework or find a new book to read for fun.